Grout really takes a beating and it is possible that you have not noticed how your tile and grout really look. If you look closely, you will notice that tile and grout cleaning is needed. 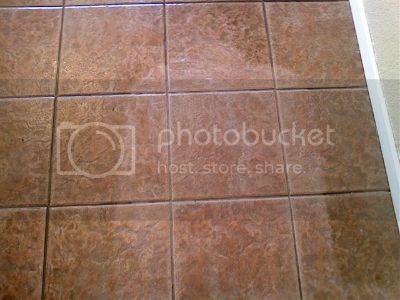 The dirt and stains that get embedded in the grout between your floor tiles is easy to overlook. When you have tile & grout cleaning done however you will see a brighter cleaner floor that will visibly be a noticeable improvement. If you are trying to sell your home consider how having your grout cleaned could add value to your home. The different types of stains that can cause your grout to look dingy are stains from oil, spills, grease if you want to eliminate the stains and the grime you can try and do it by trying to scrub it yourself (very difficult job) or you can call Dr. Clean and we will use the power of our tile and grout cleaning system to make your tile and grout look as good as new. Dirt and mold can get ground into your tile and grout, this is why your tile needs to be cleaned periodically. Mold is a common cause of allergies and depending on the type of mold can cause respiratory problems. Ground in dirt on your tile and grout can make your floors look dull with no luster, but cleaning your tile & grout can reverse this and make your floors beautiful again. If you are putting your home on the market and you have tile, you need to have the grout and tile cleaned. Having the floors look great can make a big difference in how a potential buyer will view your home. Having Dr. Clean come over will have the floors looking fantastic in a jiffy! If you have decided to have your tile and grout cleaned, please give Dr. Clean a call we will treat you right and your floors will look gorgeous! Air Duct Cleaning Click Here! Book Your Appointment Now Online! Click to Book Online!